Very tasty quick and easy. Enjoy. ~ Cook the sausage in a pot over medium-high heat. ~ Add the onions, salt, and pepper, cooking until the onions are translucent and sausage is starting to brown. ~ Add the marinara, milk, and basil, cooking until sauce has thickened slightly. 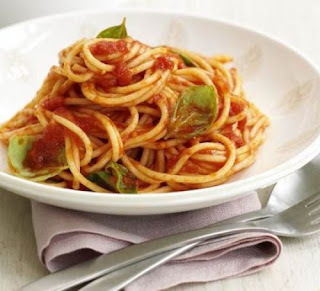 ~ Add the spaghetti, and toss until evenly coated and sauce sticks to the noodles.